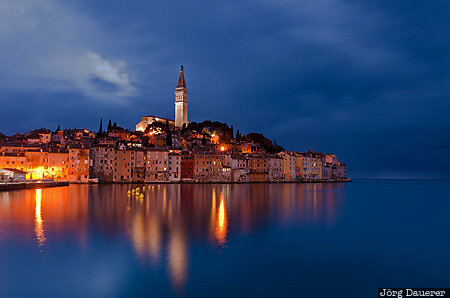 The flood-lit skyline of the city Rovinj surrounded by the Mediterranean sea dominated by the tower of the St. Euphemia's Basilica at the blue hour after sunset. Rovinj on the peninsula Istria, Istarska in the north west of Croatia. This photo was taken in the evening of a cloudy day in November of 2014. This photo was taken with a digital camera.